Research by Agriculture and Agri-Food Canada showed that when untreated urea was placed in bands two inches below the surface, nitrogen loss due to ammonia volatilization was more than 25% (Figure 1). Additional moisture below the soil caused the incorporated urea to dissolve and hydrolyze quicker, releasing more ammonia gas. Lost nitrogen can have an impact on your yield and return on investment. 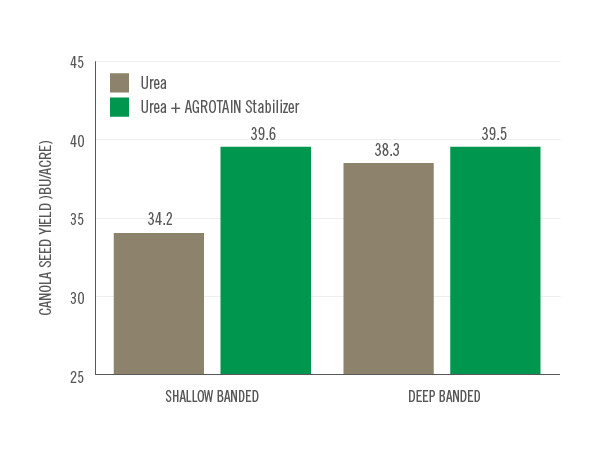 Research conducted on canola at sites across Alberta, Saskatchewan and Manitoba showed that protecting shallow-banded urea with AGROTAIN® nitrogen stabilizer resulted in a 5 bu/acre average yield advantage compared to shallow-banded unprotected urea (Figure 2). 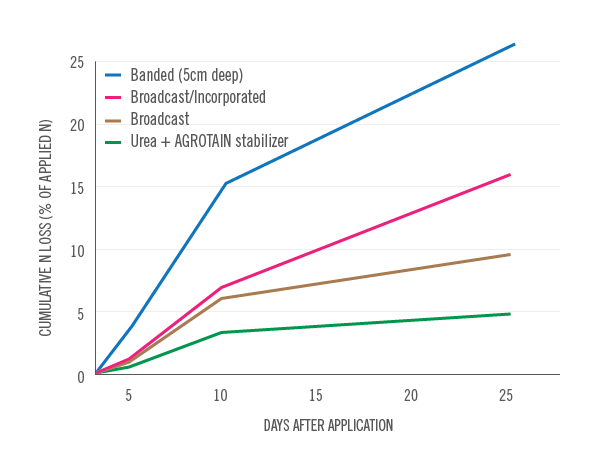 AGROTAIN DRI-MAXX stabilizer is proven to control nitrogen loss from volatilization, ensuring that your nitrogen investment remains readily available for plant uptake. Protect your nitrogen investment, yield potential and return on investment with AGROTAIN DRI-MAXX nitrogen stabilizer today. *The underlying data was provided by Agriculture and Agri-Food Canada and neither Agriculture and Agri-Food Canada, not the individual researcher referenced, endorse of recommend any product or service. *The underlying data was provided by the University of Alberta, Indian Head Agricultural Research Foundation and the University of Manitoba, and neither the University of Alberta, Indian Head Agricultural Research Foundation and the University of Manitoba, nor the individual researcher referenced, endorse or recommend any product or service.